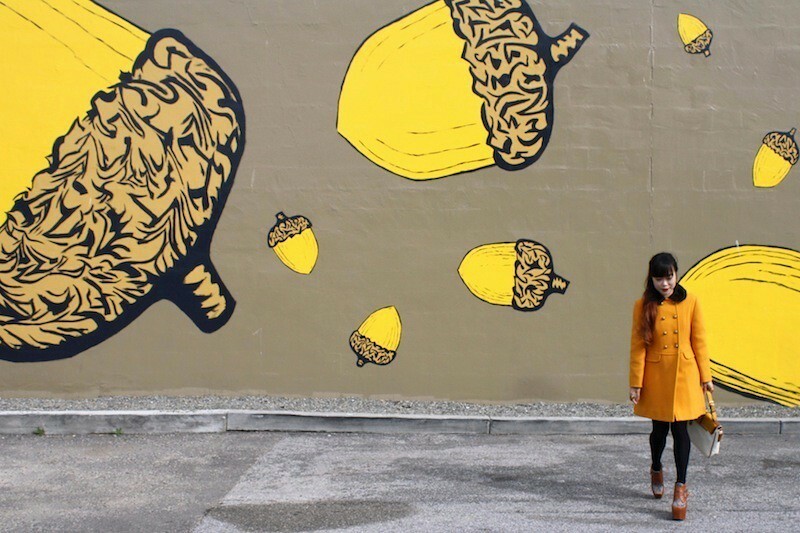 Here I am, standing in front of the "Raining Acorns" mural by local Santa Cruz artist Bob von Elgg. I love this wall, it is big and fun, and I love how the acorns are quite cartoonish. 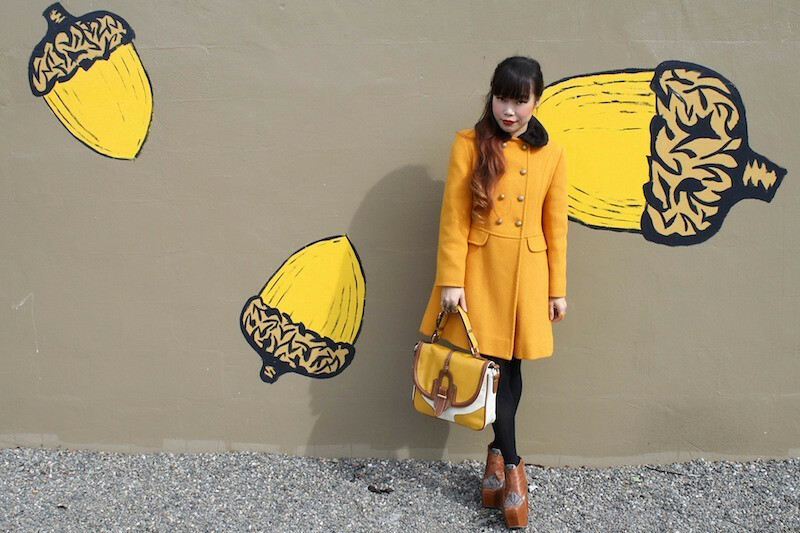 I decided to play with the mustard color of the acorns by wearing a mustard dominated outfit! I absolutely adore this vintage coat! 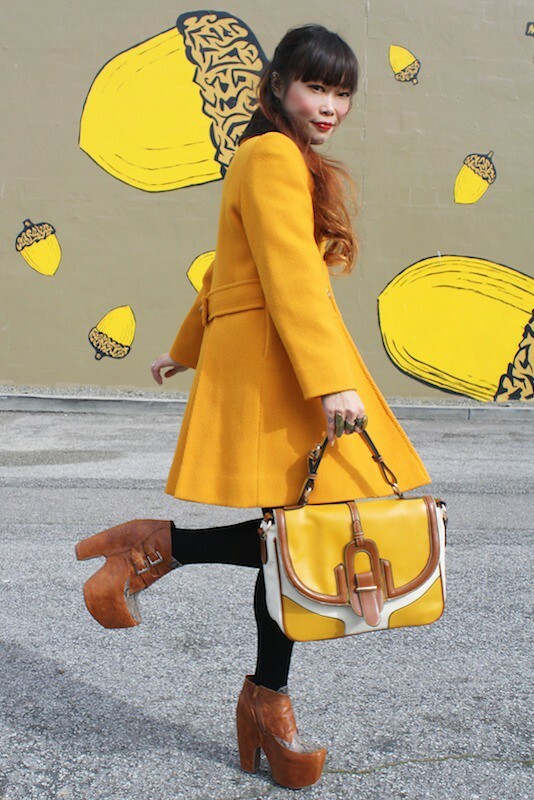 I find that most mustard colored coat are usually a muted mustard or ogre mustard, so when I came across this bright marigold mustard coat I knew I had to have it! OMG! It has a fur peter pan collar too! How amazing is that? Oh and this bag... so very mod looking but don't let it trick you, it is not vintage! 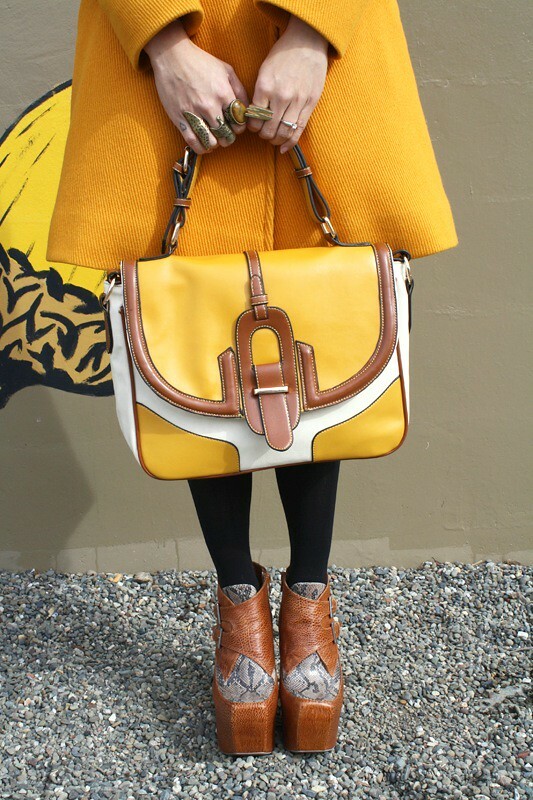 I love how the mustard with cream and brown matched nicely with my coat and shoes! Vintage fur collar mustard coat by Tailored Talent from Etsy. Warrant leather and snakeskin booties by Jeffrey Campbell from Karmaloop. Also, that mustard colour goes so well on you, and love the mustard colour acorns! Such an awesome place to take photos! You have the best shoes!!! This is so great! I love your whole outfit. The location is perfect too! Perfect backdrop and most stunning shoes. Can I please steal your coat, it's awesome!!! And that mural, is fantastic!! wow!! this is outrageously fun!!! amazing! You always have cutest outfits and pictures! Im dying for your Jeffery Campbell's! i love this wall with this outfit! where is this? Hi Toshiko! I ran across your post with my acorn mural complemented beautifully by your lovely acorn-color-matching fashion. I will post a link to your blog on my website. For the commentors who asked, the mural is located on the back wall of Safeway, 2203 Mission Street, Santa Cruz, CA, next to Taqueria Santa Cruz. It is 18' tall by 84' wide. To see a timelapse video of the mural installation visit: http://bobvonelgg.com/mural-timelapse.html Thanks again! Hi Bob, thank you for your comment and thank you for linking my blog on your site. 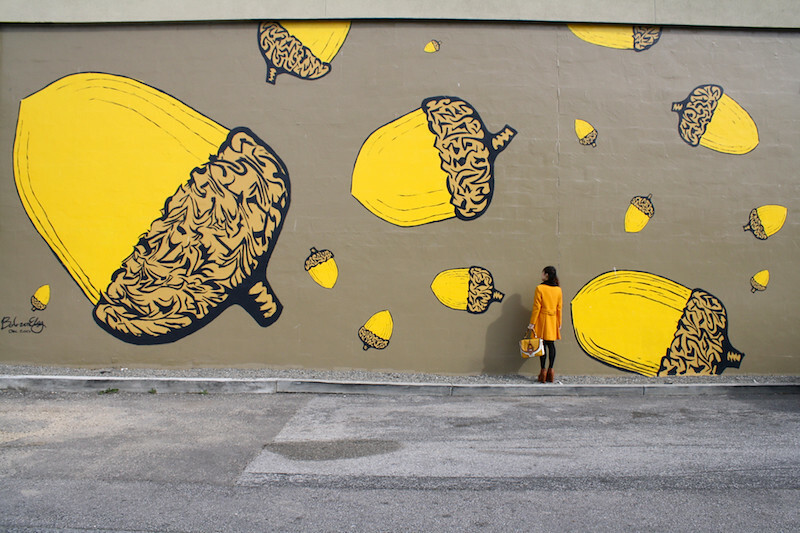 The acorn mural is amazing, one of my favorite murals in northern california! I especially love its vibrant color! Keep up the great work! I love this shoot! Would it be OK with you if I use one of these photos on santacruzpublicart.com and/or on the Santa Cruz City Arts facebook page? I would definitely give photo credit and link to your site. Hi Crystal! Thank you! Of course you can use these images as long as they are linked to my blog! Thanks!